A street sign for Wall Street. We may never have definitive answers to these questions. 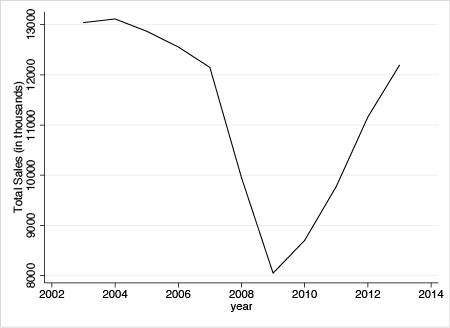 But in new research, we suggest that without federal intervention to stabilise financial markets and recapitalise some non-bank lenders such as GMAC, the magnitude of the economic collapse in 2008-2009 might have been much worse (Benmelech et al. 2016). Before the financial crisis, a large network of non-bank financial institutions, such as mortgage brokers and consumer finance companies —the shadow banking system — became increasingly important sources of credit in the US. For example, finance companies like GMAC financed about half of new car sales in 2005. The form of shadow banking financing differed markedly from traditional banks. While the latter use government insured deposits to make loans, non-bank lenders make loans using short-term uninsured wholesale funding, mostly from entities such as money market funds (MMFs) and pension funds.1 In 2008 and 2009, MMFs and pension funds became unwilling or unable to fund many of these non-bank lenders (Kacperczyk and Schnabl 2013). Car sales collapsed in the US, and GM and Chrysler entered bankruptcy.